Patterned toilet paper is nothing new, there have been comic toilet tissue rolls, Sudoku puzzle patterns, even Hello Kitty tissue rolls but this may be the first time an entire novel has been given the TP treatment. We can thank Koji Suzuki for agreeing to subject his work to a fate worse than the most savage review and Shizuoka-based Hayashi Paper for convincing Suzuki to go along with their crappy idea. Suzuki's no hack writer by the way - his previous credits include horror novels Ring and Spiral, both later made into popular Japanese horror films. His latest endeavor, , is a nine-chapter horror story that happens to be set in a public bathroom. According to Hayashi Paper, reading Suzuki's novel in a similar setting will invest what should be a relaxing experience with "psychological fright". Say Hayashi, isn't that what laxatives are for? 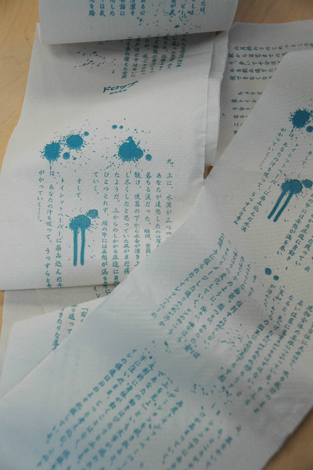 The novel itself is printed in Japanese and interspersed with gory splatters meant to evoke blood, not exactly the thing we want to see on our toilet paper. At least they're blue - which actually might be worse. 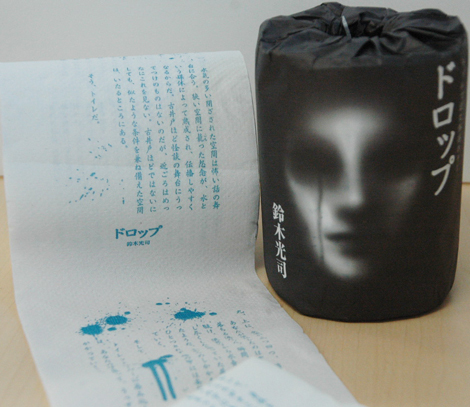 Anyone interested in purchasing Suzuki's horror-themed toilet paper can find it for sale online and at selected department stores beginning June 6. The cost is just 210 yen, or about $2.20 per roll. 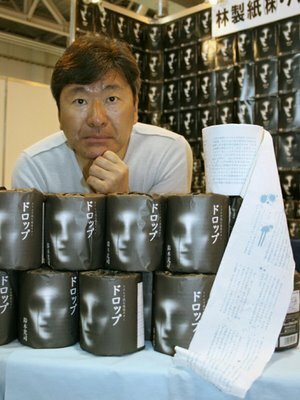 It may seem a contradiction in terms for a novel written on toilet paper to scare readers sh*tless, unless Suzuki subconsciously feels his work is worthy of preservation rather than desecration. On the other hand, if reading horror novels scares the crap out of you, you'll be ideally prepared.